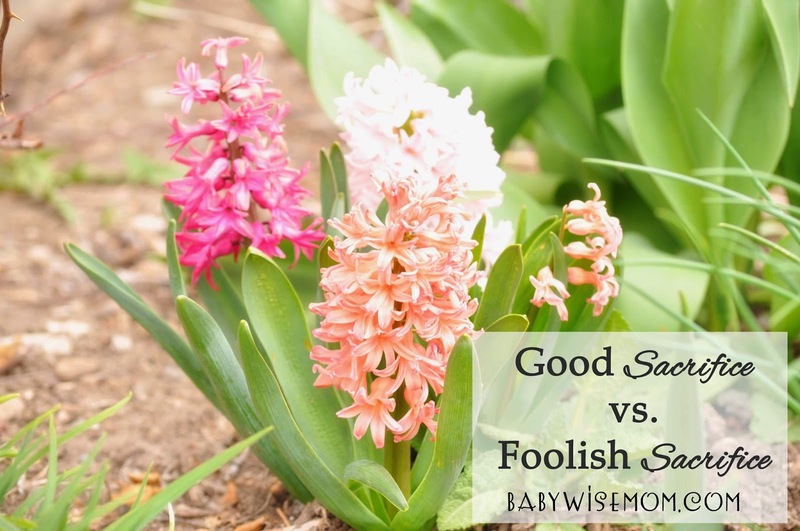 Good Sacrifice vs. Foolish Sacrifice in Parenting. Understanding when you should make sacrifices and when you should let things go. I think as women, we can easily get caught up in thinking we need to make every moment amazing and will work ourselves into the ground in order to do so. I have often said the addition of blogs to our life has increased that need within us tenfold. You see something great on a blog and want to do it/make it too. Pinterest has only magnified this even more–instead of having to find it on various blogs, you go to one location to find every good idea on the internet and suddenly feel very busy and inadequate all at the same moment. We suddenly feel like we need to spend a few weeks making the perfect decorations, cake, food, and outfit for our three year old’s birthday party while putting together the perfect outfit for ourselves daily, making picture-worthy meals, doing cute and creative hair-dos, creating mind-blowing learning activities daily, having each day ride out picture perfect to fulfill our current bucket list. We also better use all of those amazing cleaning tips, we probably should work on starting at least an herb garden, homemade gifts are the only way to go, our house likely needs to be repainted because it is looking quite out-dated after seeing all of those pictures on Pinterest, and there are too many amazing exercise tips out there to have any reason not to be in perfect shape. Oh, and we had better take amazing pictures of it all along the way. The audience of this blog is parents, so as parents, how do we do all of these things while still managing to attend to the often mundane, routine daily activities. “Little” things like taking care of our children. While I love the era I live in, I think back to my childhood. My mom spent her days being a mom. Simply. Women were blissfully ignorant of every other computer-savvy woman’s talents in the world. And so we have all of these things we want to accomplish, and of course, as any logical thinking can conclude, we do not have the time to do it all. We just don’t. At certain points in life, we might not have time to do really any of it. So we have to sacrifice things in order to get there–to get any of it. What do we sacrifice? I have done both of these things. Well, I haven’t stayed up all night for the accessory, but I have stayed up much later than is wise to finish an Easter dress. There isn’t some laundry list of things that are good sacrifices and things that are unwise sacrifices. ” Every person and situation is different, and a good sacrifice in one instance might be a foolish sacrifice in another.” What is wise for you may not be wise for me. What is wise for you today might not be wise for you in six months. A huge trick is to figure out what is the wise move at the moment. How can we tell the difference for our own situation? We can ask ourselves, “Am I committing my time and energies to the things that matter most?” There are so many good things to do, but we can’t do all of them. There are times in my life I am able to do more than others. When I am pregnant or have a baby under one, I do much, much less than I do otherwise. Each year, I typically make our family’s Halloween costumes. We do one theme and I make each costume. When McKenna was a baby, I decided it would be wise to not make them. I made Kaitlyn’s costume that year and bought every other costume. Since then, I typically buy one-two costumes, or at least portions, to cut back on the time requirement. This year, I will have a newborn and will be once again buying. I think for me, the time required to make the costumes would be an unwise sacrifice with a baby in the family. Remember the key is to sacrifice when you sacrifice something good for something better. Do not sacrifice the better for the good. I don’t intend to put down Pinterest–I enjoy Pinterest. I found myself feeling like my to-do list was very long with all of the amazing things I was finding on Pinterest to do, and it was stressful for me. I have changed my mind-set with Pinterest now. I look at all of the fun ideas and pin things I like. I do not pin with the intent of “I will do this for sure!” Just a “maybe someday if I get the time, I will do this.” I have created a board I named “up next” and have pinned a few things I would like to work on when the time seems right. This takes my ideas down to a handful instead of hundreds. This is just one way I work to control my time-management–my sacrifice management–in my life. You don’t need to do it all. You can’t possibly, but you don’t need to. Keep a constant habit of prioritizing your activities and you will hopefully be able to make appropriate sacrifices for your moment in time. Sometimes, the smartest and most mature move you can make is to decide not to do something. I agree with this post 100%. I have a 1 year old and am a practicing dentist. As if that wasn't enough, I wish I had the time to blog every moment of our lives, be a gourmet chef, be a photographer, and have every detail of my family's life "together" and picture perfect! I have held myself to the expectation that I should be a SUPERMOM, and there just isn't enough time in the day to do and be all these things. The important things I need to focus on are not on Pinterest, and I need to cut myself some slack. Thank you for not making me feel alone! That blog was for me all the way! 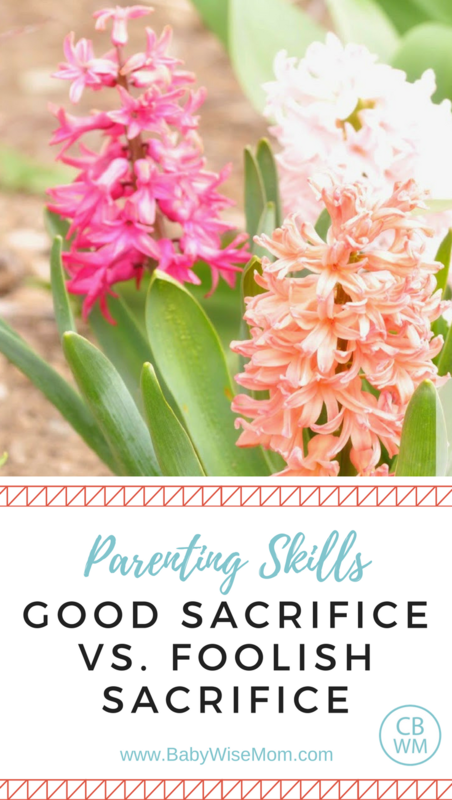 I spend waay too much time on pinterest almost daily or doing other somewhat meaningless and unimportant things now that I think about it, when I should be getting in the mommy time that my children need. Thank you for writing this. I need to prioritize my time and make sure my kids are getting what they need from me before I decide to give my attention to anything else! I often find myself answering the question "Mommy can you play with me?" with "Not right now I need to get this done". Ahhh, Im feeling guilty now. Thanks for opening my eyes. This blog was a breath of fresh air. Thank you! Such a WONDERFUL post! You see all these blogs, whether homeschooling blogs, or party hostessing blog, and you think…wow, there day must be FULL of learning activities or the party is planned so perfectly. the blog is only a TINY glimpse of what is going on in their world but we fail to realize that for some reason. I just found http://www.handsfreemama.com and have to share it. It's just one more wonderful blog that HELPS me see that I am not a perfect mom, but I am my child's hero and I am going hands free! Please check it out….all mommies of any age child will benefit! I know this blog post is old, but not does it resonate with me as a mom of a newborn and 2 yr old! It really is hard Jerusha!